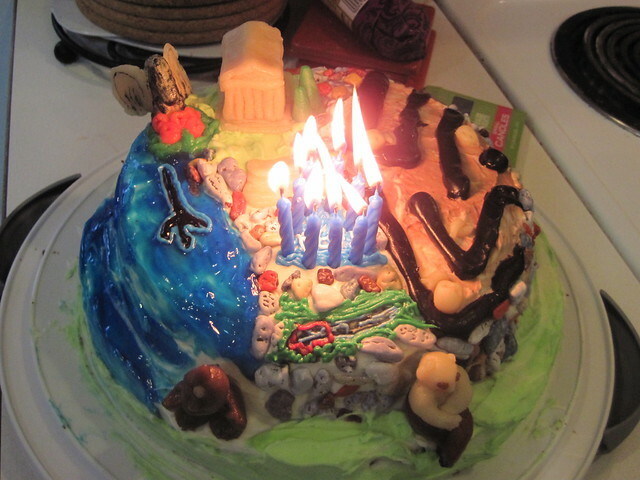 So, it's time for my bi-annual decorated birthday-cake post! Our son turned 9 last weekend and as is our tradition, I made his birthday cake in the theme he selected. This year, he was super into Greek gods and mythology after having just finished a 5-book series called Percy Jackson and the Olympians. 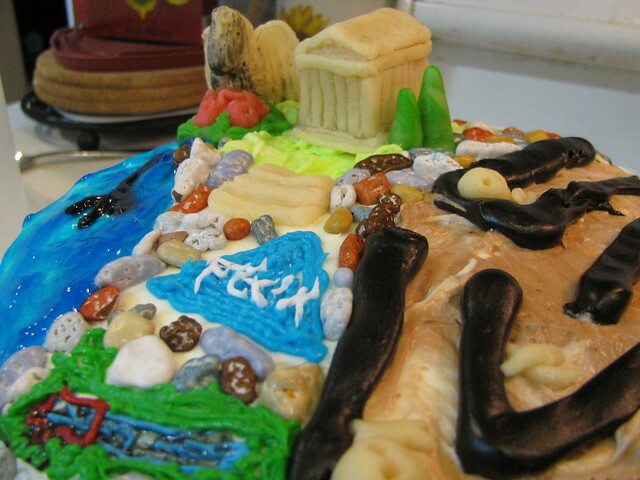 He wanted his cake to have a labyrinth, water and a Trident (because the main character in the series is supposed to be the son of the sea-god Poseidon), the Greek god Pan, a black pegasus, a cyclops, Percy's sword, and a "blue triangle that glows and opens the secret doorway to the labyrinth when pressed by a half-bloods hand. 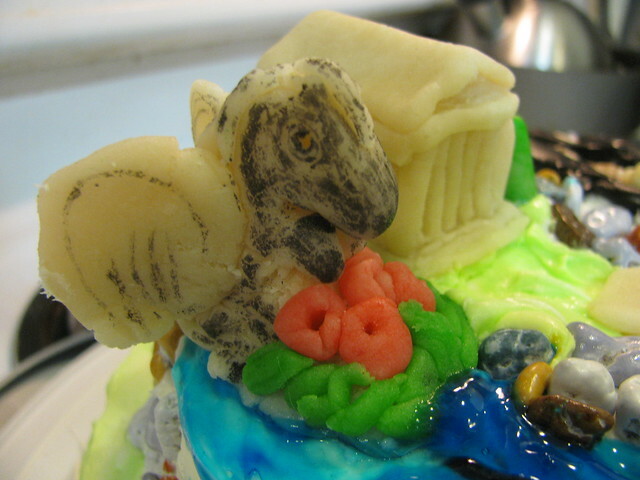 I used marzepan for the sculptures, some gel icing which I dyed blue for the water, and the rest was the cream cheese icing which we've all become so fond of. The cake was two layer - Devils Food chocolate for the bottom layer, and the top layer was the delicious white cake recipe I used for his sister's rainbow cake with swirls of blue in it because there's stuff in the book series about blue food. 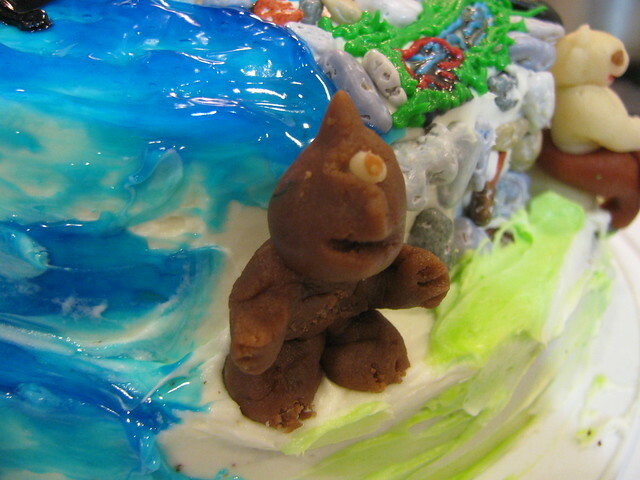 The labyrinth walls were made of fudge icing, and the rocks were chocolate rocks that I found at a cake decorating shop. I learned that making a horse shape out of Marzepan is really super hard. The flower thingies were there to add stability. ahahahah... OK I know, I know... Looks like Pan has really been letting himself go lately. I had no idea how to make a Pan - but doesn't he look pleased with himself? There ya go - glowing triangle. 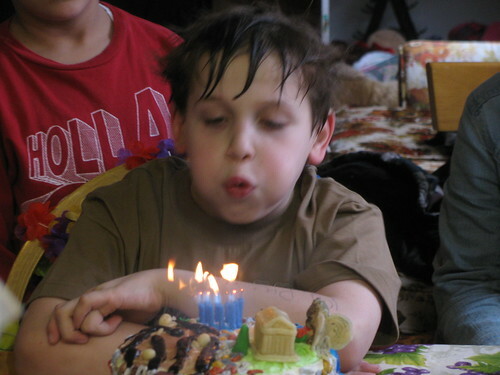 Age 9 gave us the perfect number of candles to make it happen too. A Herculean labor of love! 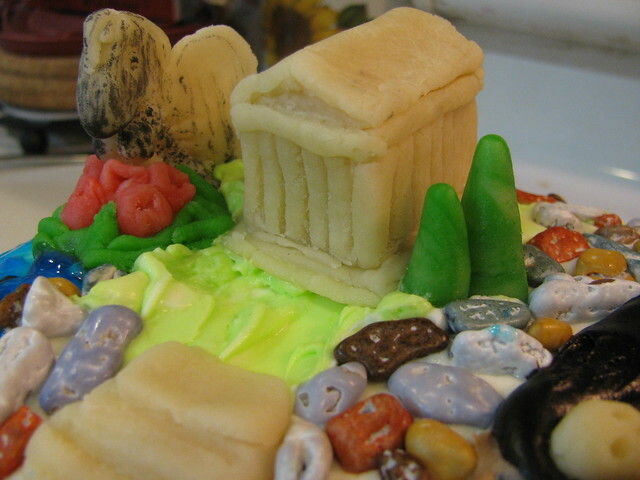 All of the figures and decorating look great, but I'm especially impressed by your Pegasus and Parthenon! 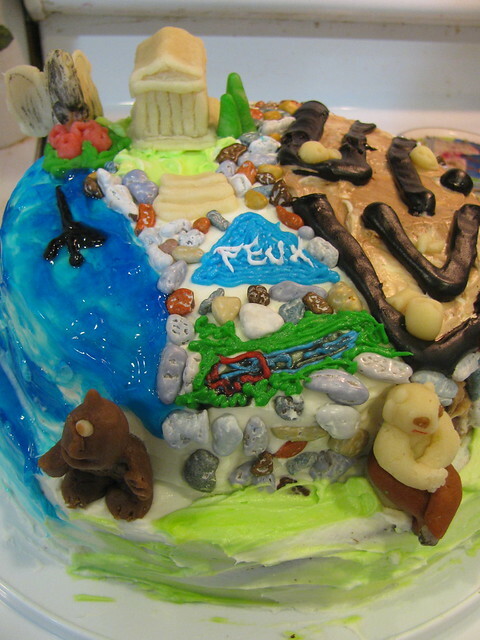 It sounds like your kids have great imaginations and you in turn have the creative ability to take their ideas and then make their 'dream cake'. Your son must have been so excited to have this cake for his birthday party! Great design, Dorota. 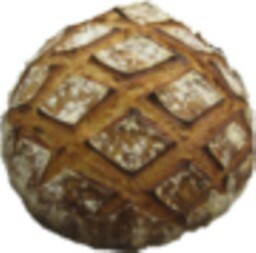 I cracked up reading your comment about Pan! 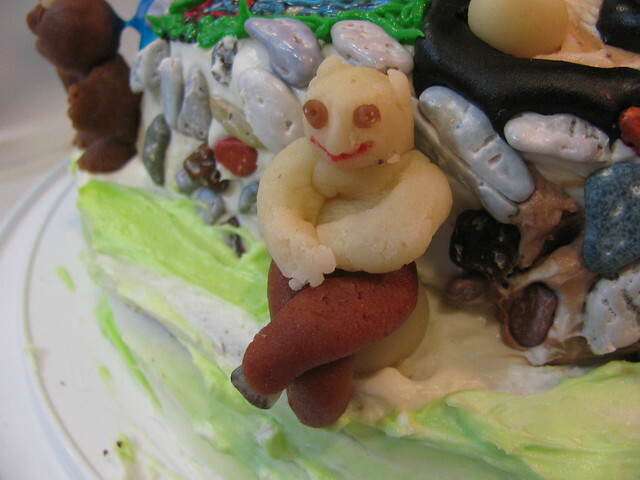 You're a super cool mom and cake designer. Floyd's pretty cool too, with that pie fight idea. Going to have to remember that one! i can see how much the kids love your cakes! What a great party and cake...it was a very tall order to fill, but it all fit great! Thank you for the background and guided tour. I'm sure the kids will be talking about the party for a long time! ...of a chocolate labyrinth. Who would want to get out of it?! Great cake, and excellent narrative. And you didn't let the adults participate? What a great memory you created for years to come. Nice cake! 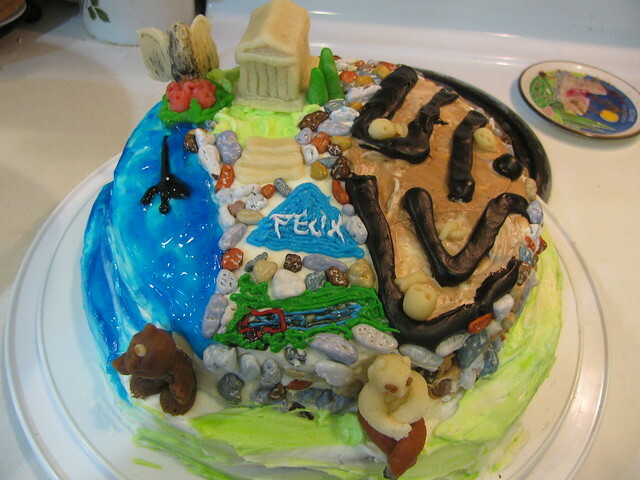 My youngest daughter is heavily into Percy Jackson--she would love this cake!